"Work hard! Sounds simplistic, but being a great leader is a skill that can be learned—provided you’re willing to work at it hard enough. Analyze the actions and approaches of leaders you admire, read books on the subject, and experiment in your style. See what works for you and do more of the same. We once thought that tomorrow’s leaders were gems waiting to be discovered. Now we know they can be manufactured—as long as the ‘raw material’ is a willing participant." For example, if a "willing participant" scores 6% out of 100% in Leadership Energy (on our CDR Leadership Character Assessment), despite their intelligence and education, they will not be well suited for a leadership role. Now, on the other hand, if someone has a mid-range score or a pulse on Leadership Energy, then yes, training and development may make all the difference. We've coached Ph.D.'s who were in leadership roles because they were effective communicators or the best in their fields, yet they scored under 10% in Leadership Energy. In every case, they were miserable (as were the people around them) and the leadership aspects of their jobs were draining and detracting from what they were really good at -- research, product development (for patents), etc. 1. STRATEGIC THINKING and PLANNING whereby you look beyond the visible and predict the eventualities proactively. You think ahead and manage the course effectively while staying ready to face the challenges if beyond your control. 2. TEAM BUILDING whereby you not only challenge your team consistently with next levels of hardwork/hardship but remain available and supportive to hold them if they fail back. You also develop your team to learn how to remain focused and be able to take existing and future challenges courageously and successfully. 3. COMMUNICATION SKILLS whereby you express yourself in a manner that your world knows to what you are expecting and how you would want to go by. I agree that Team Building and Communications skills are required of all effective leaders. 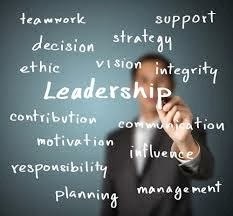 Strategic Thinking and Planning skills are critical for some leaders but not all leaders. That is, if you define strategic as only future oriented. We need some leaders to be visionary. We need other leaders who are masters at execution to get us to the future. While both traits are required for an effective organization, an effective leader does not have to possess both traits.